If you are looking for a plant that is healthy, easy to maintain and small, then our small birdcage topiary may be the perfect fit. This feminine plant has a delicate birdcage frame made from the vines of the ivy plant. A small faux bird perches inside. At the base of the topiary is a bed of green, lush ivy that forms a wreath. This is the perfect plant to set on a living room mantle, on your bedside table, or at the corner of your desk. Your small birdcage topiary will need a little care -- but once you get into the habit of caring for it, it will be like second nature. Check in with your birdcage ivy topiary every day. You'll want to test the soil and make sure it is moist throughout but not wet. You never want your topiary base to be overly wet or for the roots to be swimming in water. This will lead to the slow death of your ivy topiary, beginning with the yellowing of the vines small leaves. 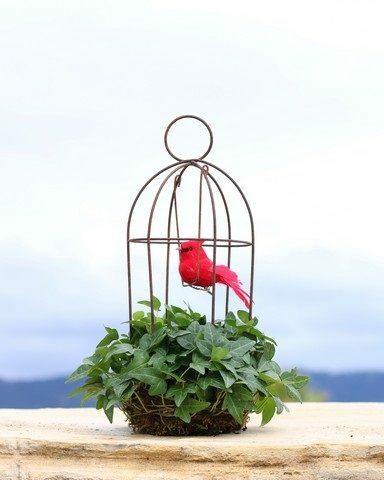 The small birdcage topiary also makes an ideal gift for someone who lives in a small space -- such as a resident of a nursing home or a patient in a hospital. It's small enough to sit on a bedside table or an entryway table without taking up a lot of space. At the same time, it adds aesthetic appeal and cheer to a room and to a person who is undergoing a difficult situation. Add seasonal decor to your small birdcage topiary throughout the year as well, such as by hanging small wooden egg ornaments on it during the spring and small holiday baubles during the Christmas season. You'll find the small birdcage ivy topiary economical, practical and so much fun! BIRDCAGE Ivy Topiary. Let soil approach dryness between watering. Do not let roots sit in water. Exposure: Bright, indirect light. Indoor Temp: 40 - 80 degrees F, Weight: 2.25 lb, Pot Size: M , Height: 12 inches.